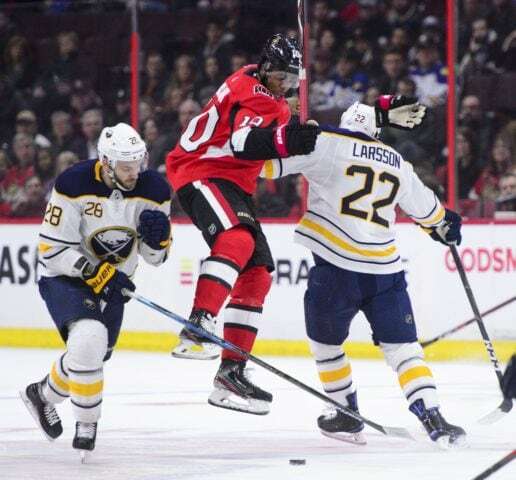 OTTAWA — Craig Anderson stopped all 35 shots he faced as the Ottawa Senators shut out the Buffalo Sabres 4-0 on Tuesday night. It was Anderson’s second shutout of the season. Brian Gibbons had a goal and an assist to lead Ottawa (27-43-6), while Anthony Duclair, Rudolfs Balcers and Magnus Paajarvi also scored. The win marked the first of a four-game homestand for the Senators, who are playing its first game after a three-game road trip through Western Canada where they went 1-2-0. Ottawa has now won its last three home games where they’ve outscored its opponents 12-2. Carter Hutton made 27 saves in net as Buffalo (31-36-9), lost its fourth straight game. Coming off a disappointing 3-1 loss to New Jersey on Monday, the Sabres rounded out their three-game road trip 0-3-0. Buffalo is 1-10-1 in its last 12 and are 0-11-2 in their last 13 road games. After a solid first two periods the Senators extended their lead early in the third. Ottawa took a 3-0 lead on a Balcers power-play goal at 5:54 and less than two minutes later made it 4-0 as Paajarvi scored his tenth of the season off a great passing sequence. This marks just the second time in Paajarvi’s career that he hits the ten-goal mark. Trailing 2-0 the Sabres had a much better second period, but were unable to find a way to beat Craig Anderson. Buffalo’s best opportunities came on the power play, but despite some solid chances could not find the back of the net. The Senators jumped out to a 2-0 first period lead on goals from Duclair and Gibbons. Duclair scored at the 17-minute mark as he took a pass down low and beat Hutton with a backhander. With 11 seconds remaining in the period Gibbons scored Ottawa’s second tapping in a Christian Jaros pass. Notes: Ottawa was without veterans Zack Smith and Cody Ceci as both are dealing with injuries. Buffalo’s William Borgen made his NHL debut Tuesday.